I am trying to write this from not-my-computer, but rather a mobile device, so we'll see whether it works or not. I've actually been missing blogging a lot. It feels very 2005 to me, but I miss the longer form. I've been having great conversations on Facebook and Twitter, but I am really more of a long-form person, which longtime readers probably know without my explicating it. I have 147 drafts in my drafts folder, stretching from May 2006 to October 2013, so you may seem some of those backlogged posts soon. Maybe. I thought I would start blogging again before, and that didn't happen, so it may not work this time, either. It's not just the Wall Street Journal that is guilty of this type of oddly-skewed-to-the-wealthy-while-pretending-that-they-are-middle-class-or-poorer journalism. The New York Times is full of it. In this article ("What Is Middle Class in Manhattan?" 1/18/2013), for example, someone says that "making $250,000 a year is...maybe the upper edge of middle class." Claims like this one, that earning $500,000/year in Manhattan makes you middle class, abound. I have a hard time with such claims. I think it's really hard for a single person to live on $35,000/year or less in Manhattan, unless (maybe) you manage to find a really cheap rent stabilized apartment in Harlem or Washington Heights or Hamilton Heights and your job comes with excellent medical, vision, and dental benefits. Maybe even $40,000, if you don't have health insurance through your job and don't want to live in a converted apartment (wherein part of the living room becomes a bedroom), in Washington Heights, or in a tiny studio, or if you don't have dental insurance or bad teeth. I am sure that it costs a lot more once you have kids. I don't know if it costs more or less if you're married. (Some people claim that it costs more and some people claim that it costs less. I think it depends on where you're coming from. Two single people sharing a converted one bedroom vs. a married couple sharing a one bedroom seems about the same to me.) 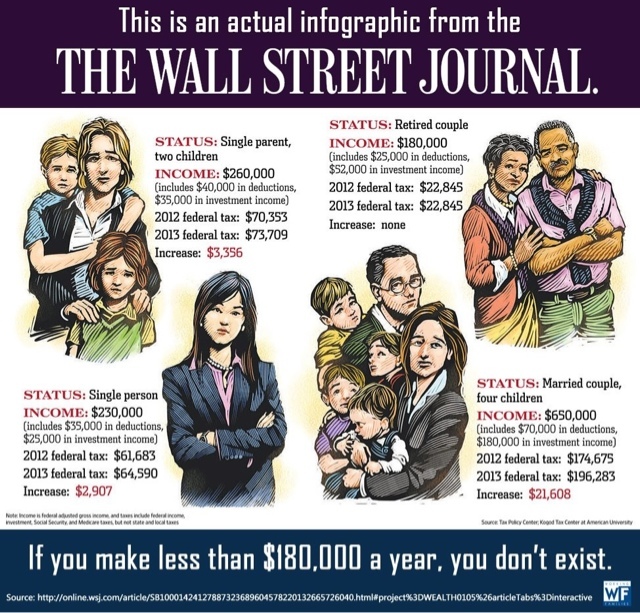 But I cannot imagine that a family of four earning $200,000/year is barely squeaking by, or a family of six earning $650,000 is struggling in any way. If they are, move to the 'burbs!